See this map for reference. There will be WiFi access via Eduroam at all venue sites. Probably one of the computer accounts that you can use at your workplace already provides for Eduroam access. Please ask your local system administrators for help with setting up Eduroam on your computer, as the configuration parameters depend on your home institution. In case you are lacking Eduroam access, you will find a temporary account that can be used for unencrypted WiFi on the back side of your conference badge. We will also try to provide a limited number of wired connections to the net. To the Forum and Training Event on June 15 / 16, 2016: take Bus 32 from "Heidelberg, Hauptbahnhof" to "(Neuenheim), Kopfklinik" and get off at stop "(Neuenheim), Uni-Campus". Then, cross the street and walk back 100 metres and go round the corner of building 130.1, where you will find its entrance. 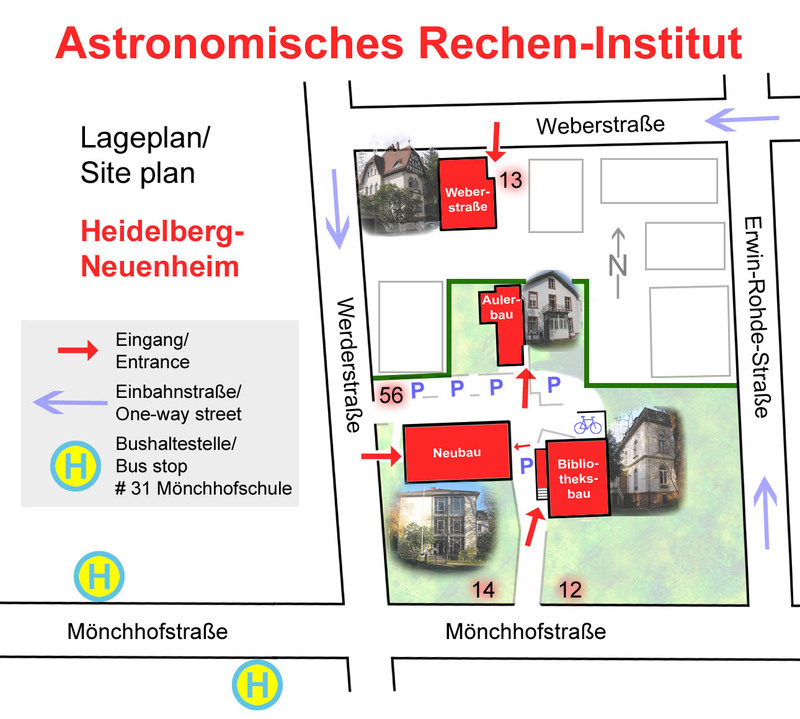 To the Virtual Observatory data publication training workshop on June 17: take Tram 5 to "Weinheim" and get off at stop "Kußmaulstraße"
By German railway to Heidelberg main station (Hauptbahnhof). Note that the airport has got two train stations, you have to walk to the long-distance train station "Fernbahnhof", shown as "Frankfurt(M) Flughafen Fernbf" on the train schedule website (€ 25.00). Once in Heidelberg, follow directions under "public transport" above. a) Using the Airport Transfer and Limousine Service (TLS, phone +49-6221-770077). Depending on which airline you are using, you will be picked up at the Meeting Point at either Terminal 1 or 2. TLS will take you directly to the .... Advance reservation with information on the airline and flight number is required (€ 35.00). b) The service provided by Wörns T. S. GmbH, phone +49-6227-358-9222, is slightly more comfortable and slightly faster. Prices vary depending on the number of passengers transported. By Lufthansa airport shuttle. The bus stops at the meeting point in terminal 1 B 3 / arrivals level. It will take you to the Crowne Plaza Hotel (Kurfürstenanlage 1–3) in Heidelberg (€ 25.00). From there, you can take a taxi. Alternatively, proceed by tram / bus from the nearby stop "Heidelberg, Seegarten". Take the Hahn Express coach for either airport, or use shuttle services for Frankfurt-Hahn or Baden Airpark, respectively. Take autobahn A5 and leave it at junction No. 37 with autobahn A656, direction Heidelberg. The closest parking opportunity is "Parkplatz 22" (€ 7.00 / day). From there, walk 350 metres to the Marsilius-Arkaden. Here you can find a map with other car parks nearby (only those painted in blue are accessible). For parking in the city centre, see the website of Heidelberg's car parks, with indication of free spaces. radhof BERGHEIM inside Heidelberg main station (Hauptbahnhof) on platform 1b, phone: +49-6221-89373-45. VRN nextbike, with bike rental stations all over Heidelberg. Call a bike, with bikes at Heidelberg main station.